He came into our lives unexpectedly. He captured our hearts as well as those of our neighbors and strangers who became friends. It began on a cold wintry night, about 15 years ago, in a forest area just behind our house in Kew Gardens, Queens (We live just behind Forest Park, the last great project of the city of Brooklyn in the 1890s before it was swallowed by New York City). My wife was coming home after yet another dreadful ride on the horrific state-run New York City subways. She heard a few meows, then stopped and looked into the woods. Out from behind the trees came a friendly cat who was formally attired. He was primarily black with a touch of white. He was apparently looking for a home or perhaps had become confused about where a formal event was being held. So began a special chapter in our lives, our special time with a wonderful friend. He took a little while to become a beloved member of our family. 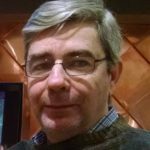 At first, he ran wild around our small apartment here in the heart of Bunkerland, encouraging the other two cats of the house to become a thundering herd of feline mayhem. He could be a young pain at times, knocking things over unlike most other cats who, unless it was meal time, usually had only two speeds: slow and slower. But although my wife immediately recognized that Tuxedo was an extraordinary creature when she started walking him like a dog in the yard, it took me a little while to understand that he was unique. What got my attention was that, whenever I went to the door, Tuxedo was always with me. He wanted to go out as frequently as a dog, which meant just about all the time. 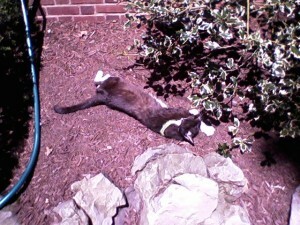 Tuxedo also loved to go sun bathing (See photo above). Once, going outside to take some garbage to the incinerator, Tuxedo, who came out with me in the hall to protect me against any criminal elements, did something extraordinary. As I scooped him up to take him back inside, he reached out with a paw to touch my beard. It was a soft, affectionate touch, the touch of a lover. It felt like he was stroking me. It was as though I was his pet instead of the other way around. He was an amazing little creature. Tuxedo was remarkably at ease around us and everyone, especially strangers who were usually charmed by the Welcome Wagon cat. But he provided limitless charms for us, who were lucky enough to adopt him, or possibly it was the other way around since he was an atypical cat. He would jump into bed with us. He also seemed to think I—no matter where I was—was a big comfortable bed and would lie all over me. (See photo) Indeed, the night before his death, he was lying on my legs on the living room couch, something that he had done so many times before. I wish he could do it again forever. My favorite Tuxedo trait was when I would be lying on the couch dosing. He would come up on the couch, finding the smallest space possible next to me and squeeze in for an hour or so. As I was dosing, I could hear this lovely purring. It was very relaxing to have my little friend so close. 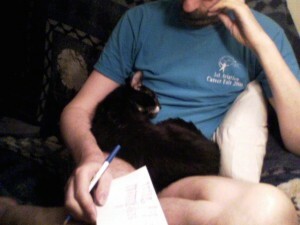 And when I was reading on the couch or a chair, there would be Tuxedo, lying right in my lap for hours at a time. At times, he would knead me, then fall asleep on my chest. Some of my other cats would join. (See photo). 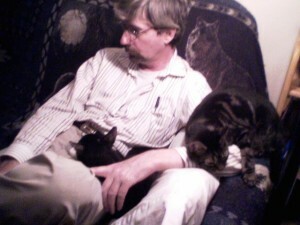 To this day, Portia, one of the other cats, likes to lie all over me. She learned that from Tuxedo. 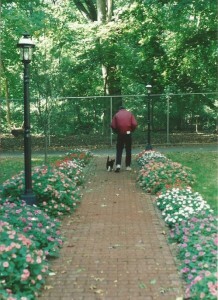 The Tuxedo legend would grow thanks to our walks in the yard. He would often walk alongside me—his thin long tail straight up—as though we were two longtime friends out for a constitutional. Actually, we were. It was just me and my black and white shadow (See photo). I never put him on a leash, although he had a name tag. Actually, it was a World War II dog tag Suzanne purchased at the Soldiers and Sailors Memorial Hall in Pittsburgh. We let him roam at will because that’s what he enjoyed and because our wondering boy would always return. Indeed, like a dog, when I called him, he would come. He was also daring. 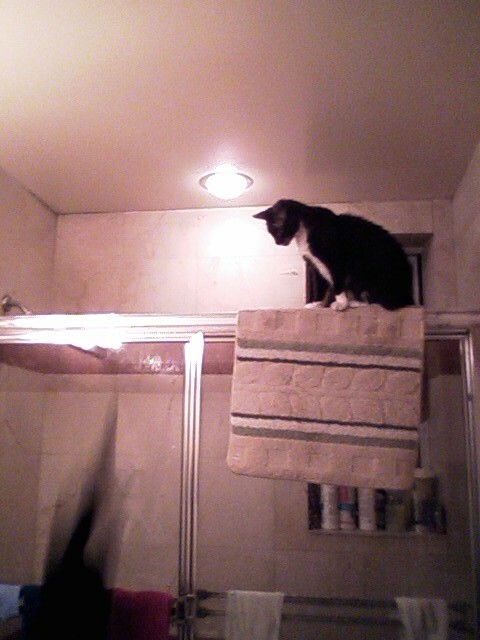 He was a little athlete who loved to jump up on the thin rod above our shower and balance himself. Sometimes he’d be up there for hours (See photo). Just before he died, he looked up at the rod, carefully calculated his jump and successfully did it one last time. It was quite a feat for a cat who was dying. But Tuxedo was also an acrobat outside. He had enjoyed his adventure. Tuxedo would have made a good ambassador. He was never afraid of different things or people. He was never scared or spooked by any situation. For example, when I’d walk Tuxedo and we would encounter little dogs, he would also let them run around him and play to their hearts’ delight. However, let Tuxedo come across a dog two or three times his size, and Tuxedo was ready for a fight as he got his back up. Several times I had to pull him away. He wasn’t afraid of any dog. 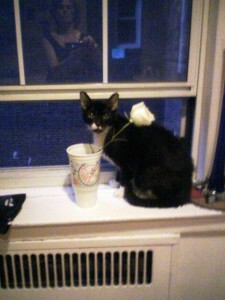 Tuxedo was a Courageous Cat and he helped others. 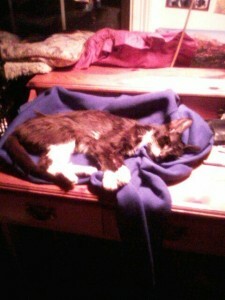 Once, when my wife was having a nightmare and hollering, Tuxedo reached out with his paw and awakened her. Another time, when there was a small fire across the street in Forest Park, Tuxedo kept looking out the window until he got our attention. Through Tuxedo’s alertness, my wife called the fire department. Tuxedo was also a protector. For example, we got a new cat, a kitten, Benny. The first day he was so small he could fit in the palm of my hand. Portia tried to bully him. Tuxedo immediately started to protect Benny. It usually takes cats a few days to get used to each other. However, Tuxedo and Benny were fast friends in a few minutes and were running around together. Tuxedo became a father/big brother to Benny. Soon Tuxedo and Benny were playing together around the hall outside together as my armed guard doubled for incinerator visits. With Tuxedo and Benny—a.k.a. Courageous Cat and his trusty sidekick Minute Mouse—I had nothing to fear when I ventured outside into an ugly part of the Rancid Apple. Tuxedo would become a well known member of our co-op community, Hampton Court. His walks in our yard and garden became legendary. Often he was off by himself while I was reading on a bench. Neighbors and strangers were delighted by his insistence on coming right up to them and caging pets. Tuxedo might have been the most petted cat in history. Two years ago, our beloved Tuxedo—after a long illness in which he fought to hold on because he wanted to be with us—laid down and died in the window sill looking out at the garden where we walked many times and in the woods beyond where Suzanne found him. (See photo Tuxedo in Death). I hope Tuxedo is in a place where he is being rewarded for all the joy he brought to so many of us. We were delighted by who he was. He was beloved by many. We miss him toujours. On wintry nights, I sometimes walk by the woods outside of Hampton Court. I often stop and listen to hear Tuxedo calling. He’s not there physically. But his spirit, his heritage and memory of joy are always there for anyone who had the privilege of knowing him.